Murrumbidgee Landcare Inc (MLi) is a not-for-profit organisation representing community Landcare in the Murrumbidgee catchment. 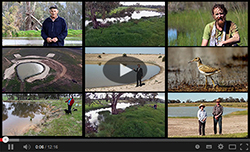 Our e-news is a project of MLi and the Regional Landcare Facilitator project, Murrumbidgee. Please contact us to have content included in our next, monthly e-news. Has Silverleaf Nightshade been a nightmare to control on your farm? Do community perceptions of agriculture really matter? The Regional Landcare Facilitator Program is an initiative of the Australian Government Department of Agriculture.